Home alerts are vital tools for deaf people to have. From the mundane to the lifesaving home alerts are all around us, all of the time. The difference is, that for most of us, these home alerts are noises and therefore we do not need to do anything special to make sure they do their job and alert us. For deaf and hard of hearing people, such alerts are useless. That is why a system of different home alerts has been developed for people who need them. Smoke and fire detectors are the truly lifesaving home alerts which are used. Time and time again it is proven that people with smoke alarms are less likely to die in a fire. Thus, it follows that there needs to be a way of making sure deaf people have these home alerts too. One of the most common smoke or fire detection systems for deaf people uses a strobe rather than a piercing noise. By using a strobe rather than a normal flashing light, the alarm should wake people up if they are asleep, which a normal light would not to. In addition, because it flashes around the whole room, you will see a strobe even if you are not facing the detector. 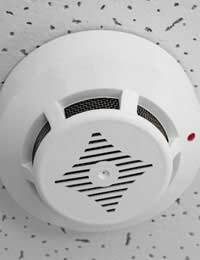 Another common method of smoke or fire detection is to buy a system which emits a signal to a receiver. This receiver is carried around and vibrates when a signal is received, alerting the person to the presence of fire or smoke. Whichever method is chosen, take safety advice over it and make sure it is powerful enough to wake you in the event of a fire. Far less vital in terms of saving lives but important enough for daily life, are doorbells and phones. Phones are the easier one to deal with because they are so portable. As mobile phones have shown, the vibrate setting is easy to use and will alert people to an incoming call or message. Home phones with a similar function can also be bought. Doorbells are less portable although one solution is to buy a remote bell which has the part of the bell which makes the sound as a portable device. Of course, it is not always as practical to carry it around as a phone, particularly if the range is not very long. In most cases, it may be better to have a system of lights rigged up in each room where you are likely to see them flash when someone rings the doorbell. Home alerts are one of those things which most of us who can hear take for granted. You just assume you will hear the smoke alarm go or the phone ring. But for people who do not hear well, it can literally be a matter of life or death and thus is vital they get correct systems installed. There are other home alerts too, things such as cooker timers, which can also be adapted using lights. Cooker timers in particular are important to get right - not just because of spoilt food but because of fire risks. On the whole, technology, things such as remote systems and vibrating phones, is making it a lot easier to have a wide range of options for home alerts. When my grandma went deaf we had these devices installed and they really are fantastic. The doorbell device was installed in my grandma's living room, where she spends most of her time, and it is just a red light that flashes when the bell is rung. It's great because now we don't have to wait for hours before she answers the door, or give her a herat attack by letting ourselves in!